Using a computer for design and layout went from just a line of text to multi-color print capabilities and advanced effects that we had never been able to do on t-shirt designs before. I also created complete design option slide shows for customers and found a smarter way to produce better advertising for our stores. Within just a couple of years, this had really changed the game. I learned everything I could and stretched beyond my reach at every chance to tackle something new. In March of 1995, with a 14 month old son, a new mortgage, eight years of experience and a head full of ideas – I told Shani that I wanted to quit my job and start Goss Graphic Design. Pretty reckless in retrospect, but I saw huge possibilities beyond what I was doing then. Everyone thought I was crazy, but surprisingly – everyone could not have been more supportive. 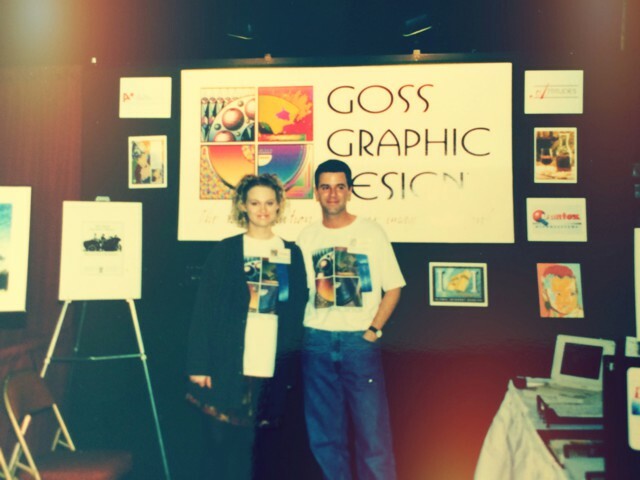 While I still had my day job, we did our first Small Business Expo as Goss Graphic Design. It went well, but I did not expect that we would be mentioned in a story about the expo on the front page of the paper. I was still trying to keep my plans under the radar, because I wanted to try to get the business going before cutting ties. When I went to work the day it came out, I had no choice but to face it head on. Preparing to be fired on the spot, I had a long discussion with the company president. He believed in my chance to succeed and suggested that I continue to work there and come and go as I needed until I got my business going. (How awesome is that?) So, thank you Jeff Black, for giving me support to follow my dream. Cut to 3 months later. I had a few clients and finally left my old job. Working from home was great, but Shani was still working full-time at her job as art director for a printing company. I knew the momentum was there. So, one day at lunch I suggested that Shani should quit her job and join me. She didn’t need much convincing, she put her two weeks notice in that afternoon. The rest, as the cliché goes, is history, but our story doesn’t end here. We want to express our sincere gratitude to the amazing clients and supporters of Goss Graphic Design throughout our 20 years in business. To celebrate this milestone and refine our own brand, we are changing our name to Goss Advertising to better express the entire range of services we offer beyond just graphics. We have also launched our new website at www.gossadvertising.com, which has an extensive portfolio full of examples of our work. We have a lot of fun things in store for this year, we hope that you will stay tuned!